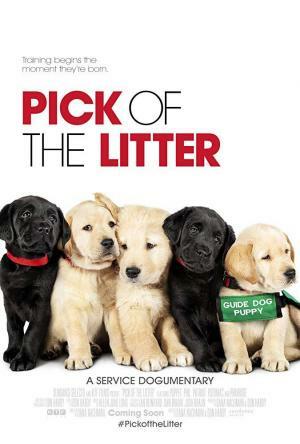 "Pick of the Litter" follows a litter of puppies from the moment they're born and begin their quest to become Guide Dogs for the Blind, the ultimate canine career. "Nachman and Hardy have produced another winning and relatable doc combining emotive storytelling with concisely focused filmmaking that's sure to charm viewers well beyond a sizable audience of dog lovers." "Though not particularly inspired in packaging or storytelling, this solidly crafted item is guaranteed to appeal to mutt-lovers (...) Brisk and pleasant, but not terribly involving or memorable." "It’s startling, even inspiring, to see how many humans it takes to condition a fully successful dog." "The film becomes more successful at actually showing viewers the rigors of becoming a guide dog"